Vintage Fully Carved Oval Chinese Hetian White Jade Hanging Plaque Pendant. 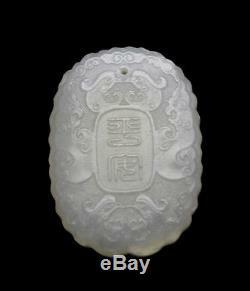 ITEM DESCRIPTION: a beautifully carved Chinese white jade necklace hanging plaque. 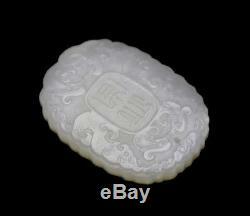 It has carved characters of "great fortune" on each side and surrounded by carved clouds. A pair of carved birds located on top and below of the center carving. In the background, you can find very fine carving lines. Both sides of the plaque are fully carved. 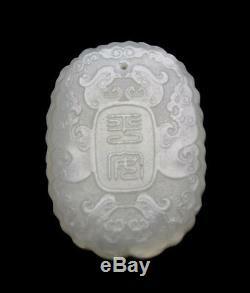 It's pure white jade, which in Chinese culture offers protection and good fortune. CONDITION: No damage of any kind, no restoration, only normal wear and tear. All item will be carefully packed with real packing material, bubble wrap, Styrofoam, foam peanut, & NO newspaper. We do our best to take professional photographs of each items we offer for sale along with accurate description. However, please keep in mind that different monitor quality and setting may create some color tune differences. Please inspect your item immediately upon arrival. FEEDBACK: Your feedback is very important to us. We are eager to work with our customers. The item "Vintage Fully Carved Oval Chinese Hetian White Jade Hanging Plaque Pendant" is in sale since Thursday, April 26, 2018. This item is in the category "Antiques\Asian Antiques\China\Necklaces & Pendants".